Like many others, Jim’s career was decided at age 6 after seeing the Beatles perform on the Ed Sullivan show in 1964. 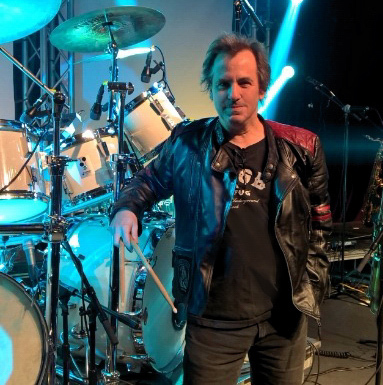 Fast forward to playing drums in the high school marching band followed by four years at Berklee College of Music in Boston and he found himself with two of his college alumni friends writing music and pressing records in New York City. “My intention was to stay in NYC for one Summer but after sharing Neve mixing consoles with people like Carlos Alomar, Jeff Skunk Baxter and Dave LeBolt I figured, I’ll just live here!”. His band ‘The Score’ gained national attention via MTV and VH1 but after 10 years of New York, the group split up and Jim moved back to his roots in central Indiana. He has joined forces with several talented musicians since and in 2016 got the call from Pink Droyd bassist Tim Hoffer. Jim uses Sonor drums, Sabian cymbals, Remo heads and Vic Firth sticks. 2019 bring us the 40th anniversary of The Wall!!! Yes, 40 years since Pink Floyd released the epic concept album that has resonated across genres and generations. A sonic masterpiece that has many depths and layers that take time to discover and unveil. Help us celebrate this grand opus!! Here comes year 2018….and Droyd’s 11th year. We are ramping up for a new year of Floyd and looking forward to seeing old friends and new faces. Celebrate 50+ years of Floyd with us.